Pace University’s International Disarmament Institute launched a new report, co-edited by Article 36 and Reaching Critical Will, on the humanitarian impact of armed drones last Friday, in a side event during the UN General Assembly’s First Committee deliberations. 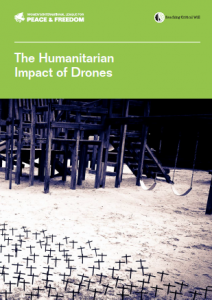 With contributions from academics, legal analysts, and survivors of armed drones, this report aims to refocus the debate about drones on the harm caused to people by these weapons as specific technologies of violence. 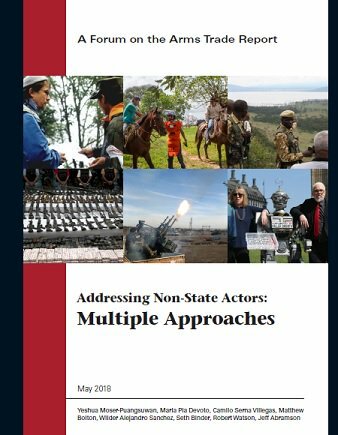 It examines the significant challenges raised by drones to international law, human rights, ethics and morality, peace and security, environmental protection, development, transparency, surveillance, privacy, policing, gender equality, and more. To learn more about the side event, click here. The development, production, testing and use of nuclear weapons has had catastrophic humanitarian and ecological consequences on people and environments around the world. ‘Nuclear harm’ – the damage caused by blast, incendiary and radioactive effects of nuclear weapons use, testing and production, as well as by other nuclear technologies – poses threats to the pursuit of the 2030 Sustainable Development Agenda. 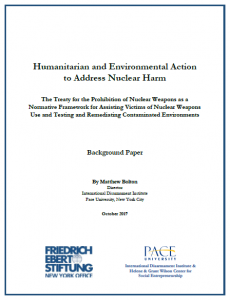 A new report from Pace University’s International Disarmament Institute explores possibilities for new global humanitarian and environmental action to address nuclear harm. Due to advocacy by the International Campaign to Abolish Nuclear Weapons (ICAN), recognized by the 2017 Nobel Peace Prize, the new Treaty on the Prohibition of Nuclear Weapons (TPNW) established ‘positive obligations’ on affected states to assist victims of nuclear weapons use and testing and to remediate contaminated environments. To ensure that the burden does not fall unduly on affected states, the TPNW requires all states to engage in international cooperation and assistance to achieve these and the treaty’s other goals. 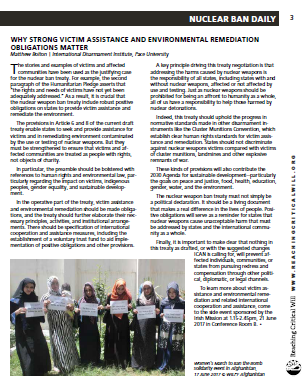 While the TPNW does not explicitly cover all forms of nuclear harm, and the universalization of the treaty may take some time, its implementation offers the opportunity to build a normative framework and institutional architecture for humanitarian and environmental action to address nuclear harm. 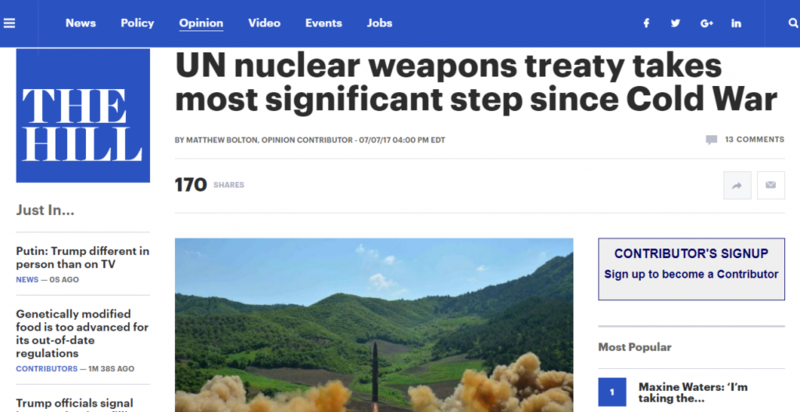 Matthew Bolton, director of Pace University’s International Disarmament Institute, published the following op-ed in The Hill on 7 July 2017 on the new Nuclear Weapons Ban Treaty. While U.S. Ambassador to the United Nations Nikki Haley condemned the North Korean intercontinental ballistic missile test this week at the U.N. Security Council meeting and threatened military action, a very different conversation was happening elsewhere in the building. The majority of the world’s countries were negotiating a new treatybanning nuclear weapons, which was adopted today by a vote of 122 in favor and only one vote against and one abstention. It is the most significant development in nuclear politics since the end of the Cold War, placing nuclear weapons in the same category of international law as other weapons of mass destruction or that cause unacceptable harm: chemical and biological weapons, landmines, and cluster munitions. Current negotiations for a nuclear weapons ban treaty have revived the efforts to abolish nuclear weapons. Similar to other types of weapons, it is hoped that the stigmatization and prohibition of nuclear weapons will pave the way towards their elimination. 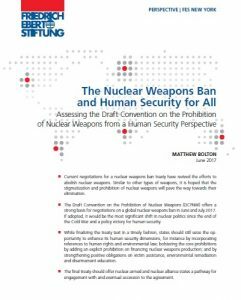 The Draft Convention on the Prohibition of Nuclear Weapons (DCPNW) offers a strong basis for negotiations on a global nuclear weapons ban in June and July 2017. If adopted, it would be the most significant shift in nuclear politics since the end of the Cold War and a policy victory for human security. While finalizing the treaty text in a timely fashion, states should still seize the opportunity to enhance its human security dimensions, for instance by incorporating references to human rights and environmental law; bolstering the core prohibitions by adding an explicit prohibition on financing nuclear weapons production; and by strengthening positive obligations on victim assistance, environmental remediation and disarmament education. The final treaty should offer nuclear-armed and nuclear alliance states a pathway for engagement with and eventual accession to the agreement. To read the International Disarmament Institute’s more in-depth analysis of the draft treaty’s positive obligations on victim assistance, environmental remediation and norm promotion, click here.